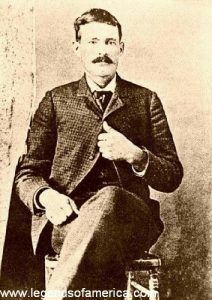 Thomas Edward “Black Jack” Ketchum was born on October 31, 1863 in San Saba County, Texas. His father, Green Berry Ketchum, Sr. died at the age of 48 when Tom was only five years old. His mother, Temperance Katherine Wydick Ketchum, suffered from blindness before she died when Thomas was just ten. Both are buried at China Creek Cemetery in San Saba County, Texas. Thomas was the youngest of eight children — six boys and two girls. Tom’s older brother, Green Berry Jr., became a wealthy and noted cowman and horse breeder. Another older brother, Samuel married and had two children, but left his wife when their son was only three. Tom and Sam worked as cowboys on ranches throughout west Texas and northern and eastern New Mexico. On their many cattle drives, they quickly learned the territory as well as the settlers and ranchers in the area. In 1892, Tom (Black Jack), his brother, Sam, and several other outlaws learned that an Atchison, Topeka & Santa Fe Railroad was on route to Deming, New Mexico with a large payroll. The gang set up to rob the train just outside Nutt, New Mexico, a water station about 20 miles north of Deming. The gang stopped the train, holding it up at gunpoint, and made off with about $20,000. During the robbery, the conductor had sneaked away, making his way to Nutt, where he telegraphed for help. Soon, a posse from Lake Valley, 18 miles to the north was on its way. However, by the time the posse arrived, the gang was well hidden in their safe house, and Black Jack soon slipped into Arizona. The $20,000 was never found. 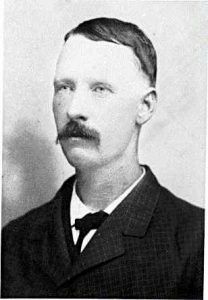 On December 12, 1895, Tom and several other men shot and killed John N. “Jap” Powers, a neighbor in Tom Green County, Texas. Tom later admitted he took part in the murder, but claimed he was paid to do it. After this episode, Tom and Samhigh-tailed it out of Texas back to New Mexico. While in New Mexico, the Ketchum Gang were well known at many of the dances, social functions and saloons in northeast New Mexico. These well-mannered young men, riding good horses, flashing plenty of money, and claiming to be cowboys, would arrive at the local functions where the women were enraptured by their manners. They were known to have frequented several establishments in Elizabethtown as well as Cimarron, specifically Lambert’s Inn (now the St. James Hotel.) Not until later, when they were captured, did townspeople learn these young men were actually members of Black Jack Ketchum’s outlaw gang. After leaving Texas in late 1895, the brothers worked at the Bell Ranch until sometime in early June 1896, when they quit, stealing supplies from the ranch before they left. On June 10th, they showed up at the small settlement of Liberty, New Mexico, north of present-day Tucumcari. During the night, they robbed a local store and post office, which was operated by Levi and Morris Herstein. The Ketchum brothers rode hard to the Pecos River after the robbery, with Levi Herstein and several other men chasing after them. A gun battle ensued at the Pecos River, leaving most of the posse dead. The brothers then headed west to Arizona, were they sometimes rode with Butch Cassidy’s Wild Bunch. Apparently the Ketchum Gang felt confident in robbing trains in this specific area of New Mexico, between Folsom and Des Moines. The area was the point where the old wagon road crossed the Colorado and Southern Rail tracks near Twin Mountain. Their habit was to stop the train and uncouple the mail and express cars, which were then taken about a mile and a half down the track and looted. On September 3, 1897 Black Jack and his gang were back at it, robbing another train, making off with about $20,000 in gold and $40,000 in silver. They escaped after the robbery, hiding in a cave south of Folsom, New Mexico where they remained until the next day. On July 11, 1899, the gang struck again, this time without the help of Black Jack. After camping at the head of Dry Canyon in northeast New Mexico, Sam Ketchum, Bill Carver, and Elza Lay, a.k.a. William McGinnis, made off with some $50,000 from the train in Folsom, New Mexico. They were soon pursued by a posse to a hideout near Cimarron, New Mexico. The outlaws were better armed with high-powered rifles and smokeless powder, while the posse had conventional black powder guns, the smoke of which, gave away their positions. Sam Ketchum and McGinnis were both wounded in the gun battle and captured. The posse faired even worse, with two of its members, including Sheriff Edward Farr, killed and another posse man injured. Sam was taken into custody, but developed gangrene from his wound. On July 24, 1899 he died in the Santa Fe penitentiary and was buried in the Odd Fellows Cemetery. On August 16th, Elza Lay was arrested and was later tried and convicted for the murder of Ed Farr and sentenced to life in prison. Carver escaped to ride with the Wild Bunch. 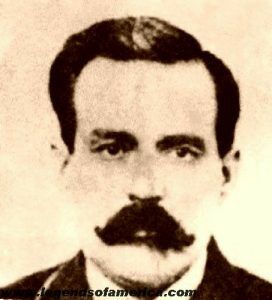 In the meantime, Thomas “Black Jack” Ketchum, unaware of the fate of his brother, Sam, made a final solitary attempt at train robbery on August 16, 1899. Waiting in a in a cave south of Folsom until after dark, he rode to the location where he intended to rob the train. Boarding the train from the blind side of the baggage car, he planned to force the train to stop, where he could disconnect the mail and express cars from the rest of the train. But, Black Jack’s best-laid plans were doomed to fail eventually. He crawled into the engine and drew his pistol on the engineer and fireman, forcing them to stop the train. However, he had miscalculated the stopping point, which was on a curve, leaving the train in a cramped position where it was impossible to uncouple the cars. Conductor Frank Harrington, whose train was being held up for the third time, had finally had it. He took his shotgun to the baggage car and carefully opened the door, pointing the gun at Black Jack. However, Tom was too quick for him and shot at the conductor, just barely missing Harrington. Harrington also shot at about the same time, hitting Black Jack in the right elbow, almost severing the arm. Tom fell backwards out of the train and down the bank. Harrington ordered the engineer and fireman to get the train moving as fast as possible. Great story. My Grandad Rentfro homesteaded a ranch about 20 miles south of Clayton so I am familiar with the town. I always liked the tale of Blackjack. BTW, have you ever heard of “Skull Mesa”, its southwest of Clayton. Grandad said it was a mesa that a party of Indians trapped a cavalry patrol on top of the mesa and either starved them or killed them there. I’ve always wondered if this is true or just one of Grandad’s tall tales. No we haven’t, but sounds like an interesting story to investigate!